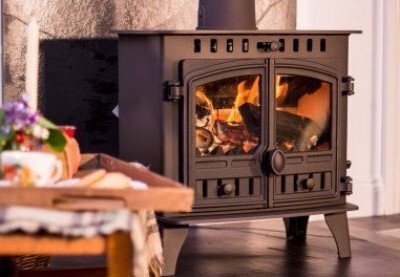 Take a Stove like the popular Hunter Herald 5 Slimline shown, which has an output of up to 6 Kilowatts. If you have an existing brick built chimney you will generally need a chimney liner package to vent the stove. This includes a cowl for the chimney top, a stainless steel flexible chimney liner, all fittings and labour. The whole package, stove and chimney, ready to light, will likely be in the region of £2000 including VAT. Exact price subject to survey and choice of stove. Smaller stove packages from around £1700 all inclusive & ready to light. – assumes you don’t currently have a brick chimney – £350 deposit and 36 monthly payments of £100. Exact price subject to survey and choice of stove. If you’re looking for a contemporary or traditional style stove but perhaps don’t have a brick built chimney, you will probably need to invest in a twin-wall stainless steel chimney system. See “Chimneys” on our page: “About Woodburners, A-Z” for more information. Or call us to discuss. 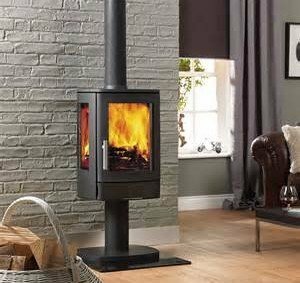 For a stove similar to that shown in the example 2 and the complete chimney system including all fittings and labour, the whole package, ready to light will be in the region of £3500 including VAT. Cash price: £3500. Deposit: £350. Amount to finance: £3150 over 36 Months. Interest payable: £481.34 . 36 Monthly repayments of: £100. 87. The minimum loan is £250 and the minimum deposit is 10% of the loan. There is no penalty for early repayment of your loan. You will need your bank details to hand – sort code & account no – when making the application. You can either apply for your loan online direct below, give us a call to arrange or pop into one of our showrooms. It’s simple to do – just the usual form filling and box ticking. Use the Finance Calculator below to check out finance details, including deposit required, loan repayments and interest payable. If you have received a firm quotation from us for your new stove and wish to proceed with the loan application simply click the “Launch Loan Application” button to apply direct. You will need an email address to apply. You will then receive an email to take you through the loan application. On completion of the application a decision is usually given in a matter of minutes. If "Launch Loan Application" won't launch, check for and clear Pop-up blocker. See small icon top right of page. Omni Capital Retail Finance Ltd. The Kent Stove Company Ltd is authorised and regulated by the Financial Conduct Authority. Our registered number is 773249. Credit subject to age and status.